You always have the most cool shops featured on your blog! I'm a follower and I love the Oval Ring with Faceted Sterling Silver. What beautiful jewelry! Love the Little Petal Flutter Hoop Earrings. I am a follower and I love the petite dainty amber/yellow sterling silver ring. Well, that's one love out of many! I'm a follower & I love the necklace with the Olivine pendant. So many beautiful things to choose from! I love her "Sterling Silver Wide Band Ring Wrap Design Stacking Organic With Labradorite and Silver Buttons", I always try and look for wider rings that would look right on my skinny fingers, and this one does the trick because it's not solid from top to bottom. And the stone and buttons add a girly touch to it! I follow you! LOVE this giveaway! The X O earrings are my fav. What a great giveaway, love the earrings too! 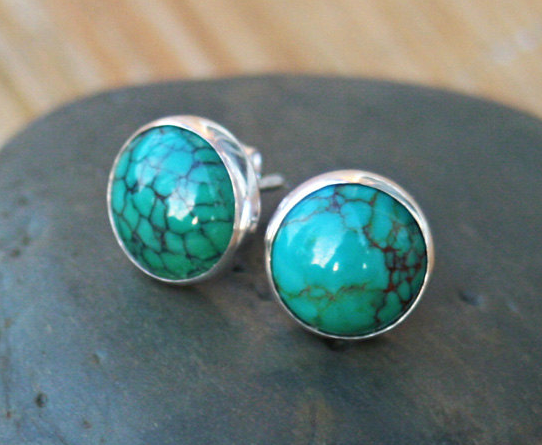 That Ocean Blue Jasper Drusy Gemstone ring is to die for! i love the copper cuff and i'm a follower of you! Love her copper cuff bracelet - gorgeous stuff! I love love LOVE the Sterling Silver Wide Band Ring Wrap Design Stacking Organic With Labradorite and Silver Buttons. My mom would love these earrings! I am a follower of DM. The rose quartz sterling silver studs are my fave! All their stuff is really nice but my favorite is the Swarovski Aquiline Crystal Pendant in Olivine. I love the Rose Quartz Stone and Sterling Silver Button Stud Earrings. So pretty! I love this necklace, the Large Dendritic Opal Gemstone Pendant Necklace/Sterling Silver Oxidized. The black and white stone is so lovely. I love pendant necklaces, and my favorite was the Twisted Paddles Sterling Silver necklace. And I liked Corilu on facebook. And I'm a follower too of course! My fav item is her Circle Round Eternity Sterling Silver Pendant Necklace! I'm in love with the dainty Labradorite and Sterling Silver dotted ring!! I'm a follower & I love everything in her store. Not sure what I would pick. i love all her necklaces! especially the eternity circle necklace. Wowza! Those earrings are amazing. I would love these or the rose quartz version. So pretty! I mentioned it on FB. I like Corilu on FB. I like the infinity necklace! And I liked their fb! The azurite teardrop necklace is so beautiful. Thanks for the opportunity to win! Love the lapis earrings! Thanks! new follower Michele P. I love the Azurite-Chrysocolla Teardrop Shape and Sterling Silver Pendant Necklace, the color is gorgeous. I'm a follower and I'm loving the mother of pearl and silver dotted button ring! Even though I have never won, I love all your giveaways! They are so pretty and you introduce me to womderful artists! I adore the Dainty Labradorite and Sterling Silver Dotted Ring & the Sterling Silver Hoop Earrings with Swarovski Crystal Pendant. Those are beautiful earrings! I love the Sterling Silver hoop earrings also! Great finds! I love the Circle Round Eternity Sterling Silver Pendant Necklace...lovely! Thanks for visiting my blog and letting me know about this awesome giveaway! I am your newest follower and I love the 3 petals sterling silver earrings and also the little blue sapphire sterling silver earrings. Love these earrings! I am a follower of your blog. :) Also, love the XO earrings! Anyhow, I also love the 'Modern Sterling Silver Circle Round Earring Studs Hoop Fluted Style Wing Effect Classic Elegant'; they're super modern and yet keep with a classic design. Following via gfc! I love the x o hugs and kisses studs. so cute! I love the X and O earrings! Like Corilu Designs on FB as Vicki Vix. I love the Amethyst purple ring. Because I love purple, Amethyst is my birthstone, and it's beautiful! Liked on FB as Alaina Moore. i love the Multi Colored Swarovski Crystal Bracelet in Sterling Silver. Very pretty and colorful. I loved the Stone Canyon Jasper Pendant Necklace in Sterling Silver. I liked Corilu on Facebook. Delighted Momma: A Corilu Christmas Giveaway!! I love the Mother of Pearl and Sterling Silver Dotted Button Ring. I'm a follower - Aik. I love the Denim Lapis Gemstone and Sterling Silver Ring!